In honor of the 60th year of the reign of Queen Elizabeth II, Diageo Philippines celebrates and unveils the Diamond Jubilee by John Walker and Sons. Diamond Jubilee was created by John Walker and Sons, Scotch Whisky Distillers by Appointment to Her Majesty the Queen, to celebrate 60 years of the Queen's accession to the throne. The blend is crafted from rare malt and grain Scotch Whiskies distilled in and maturing since 1952, the year the Queen acceded to the throne. To provide a rare opportunity to present this stunning showcase of master craftsmanship, John Walker and Sons has created two editions that will be made available for exhibit in selected locations around the world, of which has made its way to the Philippines. The event was held at the Ayala Museum with Manila's A-list crowd in attendance. Global Brand Ambassador Jonathan Driver, kicked off the night with the unveiling of the Diamond Jubilee- a Diamond shape Baccarat Crystal Decanter, standing on a crystal base with 6 radial legs to reflect the decades of The Queen's enduring reign. Leading Scottish silversmiths Hamilton & Inches has fashioned the collars set with a half-carat diamond, the royal arms, Johnnie Walker and Sons monogram and individually numbered seals. Sharing the same vision and commitment with the preservation of the art and craftsmanship, Diageo Philippines celebrated the occasion with the special exhibit comprising of rare and valuable pieces from world renowned Filipino artists and designers. Some of the pieces together with one of the first bottled Johnnie Walker Blue Label with the signature of the Master Blender Jim Beveridge, will be auctioned off for the benefit of the Asian Cultural Council of the Philippines-a foundation that provides individual fellowship grants to Filipino artists, scholars and specialists to achieve prominent leadership positions in their respective fields. We particularly enjoyed the cocktail with JW Blue blended by the Master Blender. Bizu's selection of appetizers and patisserie were excellent. Songbird Bea Tantoco thrilled the crowd with her rendition of Alicia Key's New York. Congratulations to organizers Diageo Philippines and PR Firm Eon on the success of their event. 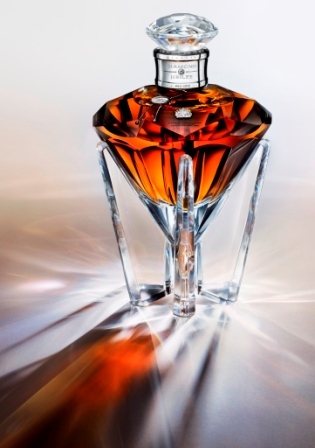 A Diamond shape Crystal Decanter executed and designed by Baccarat, standing on a crystal base with 6 radial legs which signify the 6 decades of reign of Queen Elizabeth II. Take note of the half carat diamond embedded on the collar. A silk embroidered lounge wear from Josie Natori was auctioned off. I caught glamorous ladies Suzette Lopez, and Linda Ley having a chat with art collector Trickie Lopa. Auction donors, Ambassador Isabel Wilson and Josie Natori 10. Naissa Carmona, Account Manager of EON Stakeholder PR Firm, is happy on the success of their affair. Handsome uncle, Charlie Carmona gives her a supportive hug. In the background is a Blue Label representative showing off a liter of Blue that sells for PHP8500 with the buyer's name engraved on it. 50% of the proceeds go to the scholars of ACCP Foundation.